A group of dedicated Harry Potter fans have created a new educational website called Hogwarts is Here. The site is free -- you only have to spend fake Galleons on the site -- and it lets users enroll at the Hogwarts School of Witchcraft and Wizardry and work through a seven-year curriculum, taking the same courses that Harry, Ron and Hermione did in the great Harry Potter series. The first year consists of courses that will sound familiar to any Harry Potter reader: Charms, Potions, Defense Against the Dark Arts, Astronomy, Herbology, History of Magic, and Transfiguration. The 9-week online courses feature homework assignment and quizzes. Students can also read digital textbooks, such as A Standard Book of Spells and A Beginner's Guide to Transfiguration. We have yet to enroll in a course, so we would be curious get your feedback. Fans of fantasy literature will also want to check out the Tolkien courses listed in our collection of 900 Free Online Courses. Also see this complete reading of The Chronicles of Narnia by C.S. Lewis, found in our collection of Free Audio Books. I want to join Hogwart.How can I do that? If i wasn’t in Professor Snape’s class then I wouldn’t know how to make the Wolfsbain Potin “make it perfictly every mouth so that Professor Lupin doesn’t have to suffer as he usally does during the full moon” if you get my point and as I said before he might hive me really hard Potions but you should know for a fact that I aways recve the tip grades whenever I’m in his classes and you should know for a fact that I would never joke or lie about something as important as this even it the students that go to hogwarts the most popular school in the entire wizarding world think that I’m mad crazy gone out of my mind but you should know for a fact that I would never joke or lie about something as important as this. I think that Potions is the best class that is at Hogwarts the most popular school in the entire wizarding world I know for a fact that the students of Hogwarts the most popular school in the entire wizarding world with think that I’m out of my mind that I’m mad or that I’m crazy but you should know for a fact that I would never jook or lie about something as important as this! If i was a student at Hogwarts then my favorate class would be Defense Against the Dark Arts because I would always pay attion and whenever Professor Lupin gave out any papers I would always “hand them back to him” if you get my point on time and you should know for a fact that I would help any student that needs it and you should know for a fact that I would never joke or lie about something as important as this “He’s the best Defense Against the Dark Arts teacher that I’ve ever had” if you get my point and if anyone says anything bad against him there you should know for a fact that there out of there minds and you should know for a fact that I would never joke or lie about sokmething as important as this! If I want to Hogwarts my favorate class world be Defense Against the Dark Arts and my favorate Porfessor wold have to be hands or should I say paws down teacher stile Professor Lupin because “he’s the best himeschooled Defense Against the Dark Arts teacher I’ve heve had” if you get my point and if anyone “speeks ill about him” if you get my point you’d meet a ferouss Deputy Headmistress and that’s the last think that you’d ever do” if you get my point and you should know for a fact that I would never joke or lie about something as important as this! I’m really glad that I could be in your 1005-02 home schooled class Professor Lupin if I wasn’t then I wouldn’t have lerned how in the entire wizarding world to make my fully fledged Patronus which tames the form or a werewolf” I’m also glad that you thought me the shield charm, the summing charm, and the stunning spell “your the best Defense Against the Dark Arts teacher that I’ve ever had” if you get my point Professor Lupin who is the Defense Against the Dark Arts teacher of Hogwarts the most popular school in the entire wizarding world and you should know for a fact that I would never joke or lie about something as this. If I was in you Defense Against the Dark Arts class then I would always help you in any way that I can if you were ever ill then I would just pas out each days class work, homework, spells, and tests then I would take then to you in the Hospital Wing so that way you can grade then then I would “hand then back” if you get my point to them the very next day and you should know for a fact that I would never joke or lie about something as important as this. I am a dedicated member to HiH (Hogwarts is Here) and the courses are super! It goes into detail on everything and tells you a lot about the lessons you wouldn’t know just by reading the books. You can earn points from your house by taking these courses. It’s awesome! Sign up now!! I really wish that I want to Hogwarts if I did then my best class would be Defense Against the Dark Arts because Professor Lupin has a really great pas on teaching stile he shows all of us how to use spells against Dark wizards but he would be put in the wizard jail if he showed us how in the entire world to us the unforgivable corses and you should know for a fact that I would never joke or lie about something as important as this “he’s the best Defense Against the Dark Arts teacher that I’ve ever had” he’s really great with us if we need any help then he said that we “can ask him any questions that we might have anything at all” and you should know for a fact that I would never joke or lie about something as important as this. If I want to hogwarts then my best subject 3would be Defense Against the Dark Arts because I know all about it I would even give Harry, a run for his money in O.W.L. and N.E.W.T. end of term exams and you should know for a fact that I would never joke or lie about something so get ready for the biggest shock of your entire life aright I home that you won’t take it to hard when I get great grades aright Harry. My best class would be Defense Against the Dark Arts I would even give you a run for your money Harry, because I got an Outstanding in my O.W.L. as well Harry, and you should know for fact that I would never joke or lie about something as important as this. I really wish that I was a student in your class because if “you chose a very bad time to fall ill” if you get my point Professor Lupin who is the Defense Against the Dark Arts teacher of Hogwarts the msot popular school in the entire wizarding world then I would just “fill in” for you if you get my point Professor Lupin who is the Defense Against the Dark Arts teacher of Hogwarts the most popular school in the entire wizarding world and you should know for a fact that I would never joke or lie about something important as this. My favorate Professor at Hogwarts the most popular school in the entire wizarding world would be Professor Lupin because he has a really great paws on teaching stile he brings a lot creaters to class and teachers all if his how in the entire wizarding world to defense themsleves from many types of dark creaters and if anyone says anything differenty then you should know for a fact that there out of tere mind and yous hould know for a fact that I would never joke or lie about something as important as this. It great me Hogwarts learn magic but I wound end term would have cefficate? I really loved being in you 1995-02 home school class if I was not then I would not know how in the entire wizarding world to make my fully fledged Ptronus “whitch takes the form of a wolf” if you get my point Professor Lupin and you should know for a fact that I would never joke or lie about something as important as this! “your the best Defense Against the Dark Arts teacher that I’ve ever had” if I wasn’t in your clas then I wouldn’t be able to defense my self from The Dark Arts if I was you assistant I woulds stay after class so that I could always help any of you students with there class work, homework, spells, and test and you should know for a fact that I would never joke or lie about something as important as thsi! 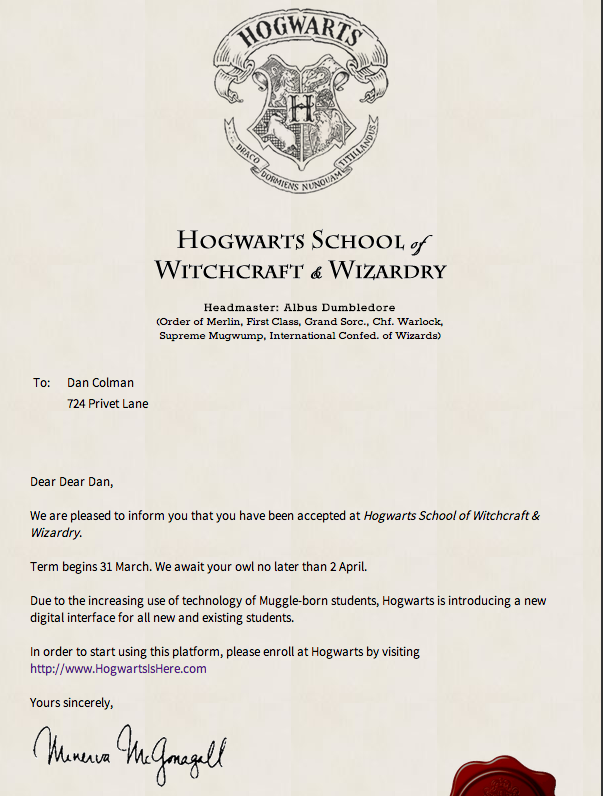 i would like to say that i am so happy to be attending Hogwarts school of witchcraft and wizardy! if i could go to hogwarts i would probably act like Fred Weasley,cause i play pranks a lot!!! if i went to hogwarts i would love to be in gryiffindor and do all the subjects with my time turner . my fav subject will be herbology and defence against the dark arts . i would be bffs with harry , hermione and ron , intact i will be sisters with hermione and live in the wizarding world . i would be prefect and would always dob on malfoy . you know as much as Harry? it will be so much fun!!!!!!!!!!!!!!!!!!!!!!!!!!!!!!!!!!!!!!!!!!!!!!!!!!!!!!!!!!!!!!!!!!!!!!!!!!!!!!!!!!!!!!!!!!!!!!!!!!!!!!!!!!!!!!!!!!!!!!!!!!!!!!!!!!!!!!!!!!!!!!!!!!!!!!!!!!!!!!!!!!!!!!!!!!!!!!!!! I would like to join how do I do that?